Many casino patrons are leaving their local gaming venues to play slots online, comfortably, from home. It is apparent that some players prefer several of the newer video slots to traditional three reel machines, however traditional slot players still prefer games like, Wheel of Fortune, Double Diamond and Jeopardy. One of the first casino slot games to be replicated in the virtual world was Wheel of Fortune. Not too long ago this game appeared online at several Microgaming casinos. Due to slot manufacturer's International Gaming Technologies (IGT) refusal to license this game to online providers, the internet version of Wheel of Fortune Slots had to be named Wheel of Wealth, but the two games are quite similar in appearance and playability. As with other popular casino slot machine games, Wheel of Fortune does have an online version, but the online version of this game goes by a different name. 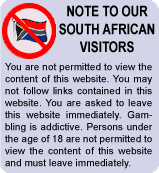 If you have read any other articles on our website, you already know that in order to provide land-based casino slots games to the virtual player base, online casinos must license these games from the slot machine manufacturers themselves. This is very expensive to do and some manufacturers, simply, do not license their games, period. The result is that online gaming software development companies, such as Microgaming develop their own virtual slot machine software, called Viper Software, and model many of their games after many of the most popular casino slots. 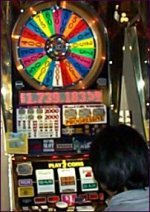 In an effort to capitalize on the popularity of the Wheel of Fortune slot machines, Microgaming was the first to develop an 'online version', so to speak, of this machine and they called it Wheel of Wealth due to the aforementioned licensing restrictions. The similarities between the online version (pictured to the right) and the actual IGT slot machine found in casinos are quite obvious. This game quickly became one of the most popular Microgaming slots online and continues to be among their most popular slots games to this day. Those who play it, simply refer to it as Wheel of Fortune Online due to the overall likeness between it and the land-based game. Wheel of Wealth is a three reel, single payline slot machine that allows the player to wager between one and three coins per spin. In order to be eligible for the Bonus Feature (i.e. Spin the Wheel), the player must wager three coins, which is identical to the casino version. Other similarities between the online and land based versions of this slot are the reel symbols (single, double and triple bars, cherries, multiplier symbols (as in the 5xPAY version of Wheel of Fortune) and the SPIN symbol. Other similarities between the online and casino versions of this slot machine, include the maximum Bonus Wheel payout of $1000 dollars and the manner in which the Bonus Feature is activated. Namely, by getting the SPIN symbol (which is the Blue Wheel) of the third reel on the payline. And just like in the casinos, the most popular online version is the one dollar ($1.00) denomination machine. Some minor differences between Wheel of Wealth and Wheel of Fortune slots, include the fact that the SPIN, or WHEEL symbol, in the online game acts as a wild, as well as a multiplier, symbol whereas it does not have these same properties in the casino version. The fact that it is wild means that it can substitute for any other symbol to complete winning combinations and, as a multiplier symbol, it also multiplies any winning payout in which it appears. For example, a single Wheel of Wealth symbol doubles the payout of any winning combination it completes and two Wheel of Wealth symbols quadruples the payout of any winning combination in which they appear. 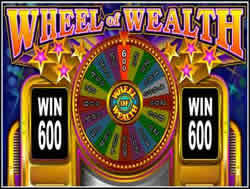 Three Wheel of Wealth symbols pays the maximum Jackpot of 5000 coins. Currently, the online game does not offer a progressive jackpot, but the demand from online players to institute such a jackpot for this game is well known by Microgaming and we wouldn't be surprised to see a modified Wheel of Fortune Online slots game that did include such a jackpot in the near future. At this time, Microgaming does offer many other progressive games with jackpots in the hundreds of thousands or millions. Example 1. A single Wheel of Wealth symbol on the payline increases the payout of a winning combination that consists of a single Cherry symbol on the payline by doubling the amount of credits awarded. With three (3) coins bet, a single Cherry symbol pays out even money, or three (3) coins. However, when a Wheel of Wealth symbol is displayed on the single payline, along with a Cherry symbol, the payout is doubled (3 coins won x 2 = 6 coins won). Example 2. The result of your next spin is two (2) Wheel of Wealth symbols and a Triple-Bar symbol lined up on the payline. Since the WHEEL symbol is Wild, it substitutes for the third Bar, resulting in a winning combination of three (3) Triple-Bar symbols. Normally, this combination would pay 240 coins with three (3) coins bet, but due to the appearance of the two (2) WHEEL symbols, coupled with the fact that these symbols act as multipliers, as well as WILD symbols, the payout is quadrupled, resulting in a payout of 240 x 4= 960 coins. The classic Wheel Of Fortune slot machine is one of the most popular casino slot machines around the world and is a favorite of online slot players now, as well, thanks to Microgaming's implementation of this game using their revolutionary Viper software. Co-branded with the popular television game show, this game provides players with a nostalgic walk down memory lane while at the same time offering an extremely exciting Bonus Round, in which the player can not lose. Pat Sajak and Vanna White would be wise to notice that this Wheel of Fortune game does NOT have any Bankrupt slices on it and every opportunity to spin the wheel is another opportunity to win real money. Maybe the game show should take a hint! In order to activate the Bonus Feature and spin the wheel, you must bet three coins and the SPIN, or WHEEL, symbol must appear on the payline on the third reel. The WHEEL is comprised of of twenty equally sized segments, each of which are labeled with a different credit amount indicating the amount to be awarded should the arrow point to that segment at the end of any given spin. To Spin the Wheel, simply Click the Spin the Wheel button on either side of the wheel (pictured below), or click the Wheel, itself. When the Wheel stops, the arrow at the top of the game screen points to the number of credits you have won, as indicated by that segment from the wheel. WHERE CAN I PLAY WHEEL OF FORTUNE SLOTS ONLINE? Certain online casinos continue to stand out from the crowd. One of the very best, if not the best, of the Microgaming casinos is Spin Palace Online Casino - which is currently offering a Sign-Up Bonus up to $3000 over your first three deposits made when you visit and download this game via this link from this page of our site. Spin Palace casino is also licensed and hold the eCogra Seal of Approval, which is an award given only to the most honest and ethical of internet gaming properties. As always, Play Video Poker Slots strives to present our visitors with the most popular slots and video poker games available online. We have received numerous emails inquiring about an online version of Wheel of Fortune slots and we always respond by indicating to these players that they need to look for a Microgaming slot machine called Wheel of Wealth. Hopefully, this review will make it a little easier for our visitors to find and play this casino favorite and one of the most popular slot machines to be offered by manufacturer International Gaming Technologies (IGT).